The fantastic thing about promotional products is that you can hand them out anywhere. Their beauty lies in the simple fact that people love to get free stuff. That's why this marketing strategy will never go out of style. 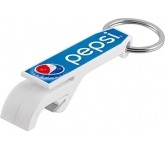 Branded giveaways such as promotional bottle opener keyrings, can get you the brand awareness and recognition you need and can do wonders for your brand and reputation! 1. bottle opener keyrings the perfect fit? 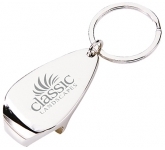 Keyring bottle openers are incredibly useful promotional giveaways, in fact they are just as practical if not more than promotional pens. They are a low-cost way of getting your message noticed and highly popular as giveaways for students for obvious reasons! 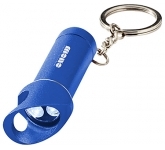 These popular giveaways are convenient at festivals and other outdoor gatherings, with businesses of all shapes and sizes utilising their practicality to spread the word about their brand. Bottle openers can create an excellent metaphor for any brand. 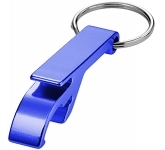 Universities, restaurant chains, retail stores, pretty much anyone can hand out bottle opener keyrings. They are adaptable and functional and every time people use them, they'll see your logo. 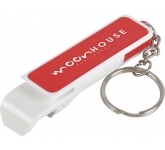 You can hand out bottle opener keyrings at trade shows, conferences, festivals and events. However, you can also hand them out at places where people aren't expecting any giveaways. For example, they are the perfect merchandise to hand out around university campuses. 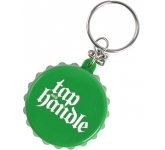 Printed bottle opener keyrings come in all shapes and sizes and you can make them in any form that will be reminiscent of your brand. 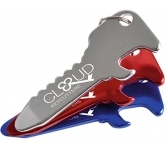 These items can be as unique as you want, their shape, colour, and form can stray very far from the flat, rectangular bottle opener keyring. 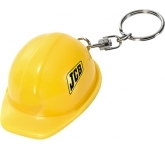 If you have a construction company why not promote it with a bottle opener shaped like a hard hat? That will put a smile on people's faces. It's witty and original. Moreover, it will make your brand memorable. When you're in a pinch, finding something that can help you brings on immense relief and you want people to associate your brand with that feeling. Finding a bottle opener dangling from your keyring isn't a big deal. However, it's a "saviour moment" and at that moment you want people's eyes to land on your logo. What's more, next time they find themselves in a similar situation, they'll think of you. That will perpetuate the saviour image. Before you know it, you'll have a new customer that views your brand as reliable and dependable. 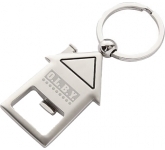 One of the great things about keyring bottle openers is that they are very durable which means that people will most likely use them for years. You could never pay for that kind of exposure in print or online advertising. It would cost a fortune! 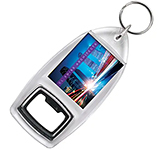 With promotional bottle opener keyrings, you have the equivalent of a dozen billboards and print ads for a mere fraction of the price. The value for money ratio is off the charts! Not to mention that due to their size and shape, bottle openers are much easier to distribute, and won't go out of style or get replaced. A trusty bottle opener is therefore a must-have! 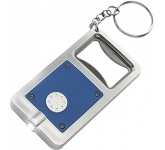 We offer a wide variety of printing options on our vast range of promotional keyring bottle openers from screen printing or precision laser engraving right through to the very latest in UltraHD dye sublimation photo print allowing us to reproduce full colour images and logos to a standard most suppliers can only dream of. Our team of graphic designers are always on hand to offer advice in product selection and to ensure that your logo is reproduced to the highest quality, representing your brand in the very best possible way. So, if you are looking for low cost, budget or cheap bottle opener keyrings, and find the same product cheaper elsewhere, just let us know and we will match the price and back it with our industry Award Winning Customer Service - that's our guarantee! 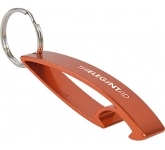 For additional information on our corporate branded bottle opener keyrings or how to effectively use promotional products, why not contact us and have a chat to one of our account managers.